Roger Daltrey didn’t write a note of “Tommy,” but he found himself as a singer telling the story of the deaf, dumb and blind boy who becomes a messiah at high-profile at Woodstock and the Isle of Wight. More than 40 years later, Daltrey is still finding ways to express himself through the character. The Who singer brought a five piece band, including guitarist Simon Townshend, brother of Who mastermind Pete Townshend, to the Midland on Friday for a trip through “Tommy” and other favorites.The band stuck pretty close to the recorded version of “Tommy,” give or take a few guitar solos and a nice gospel piano intro to “Come to This House.” “Pinball Wizard” finally got the crowd on the floor to their feet, where they stayed for the rest of the night. After “Tommy” ended, Daltrey paused for a few minutes to introduce the band before plowing into more material. For the second half, Daltrey wanted to sing some harmonies, so he enlisted the rest of the band to help out on “I Can See For Miles,” “The Kids Are Alright” and a side trip through Americana with “Gimme A Stone” and a Johnny Cash medley. Although Daltrey’s voice isn’t as strong today, in many ways he’s a better vocalist. 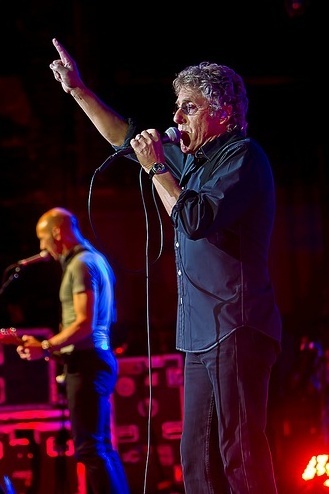 Improved phrasing and delicate attention to nuance make Daltrey more expressive than ever. This isn’t to say he doesn’t sing with authority. “Eyesight to the Blind” featured a tough blues growl, while “Smash the Mirror” and “Young Man Blues” were as forceful as the original Who recordings. In an evening filled with highlights, the best moment was a potent reading of “Young Man Blues,” which featured Daltrey’s signature microphone twirling and incorporated the Who rarity “Water.” The immortal “Baba O’Riley” concluded a generous set that ran well over two hours. Setlist: Tommy – Overture; It’s a Boy; 1921; Amazing Journey; Sparks; Eyesight to the Blind; Christmas; Cousin Kevin; Acid Queen; Do You Think It’s Alright? ; Fiddle About; Pinball Wizard; There’s a Doctor; Go to the Mirror; Tommy Can You Hear Me? ; Smash the Mirror; Sensation; Miracle Cure; Sally Simpson; I’m Free; Welcome; Tommy’s Holiday Camp; We’re Not Gonna Take It. Band introductions. I Can See For Miles; The Kids Are Alright; Behind Blue Eyes; Days of Light; Gimme A Stone; Going Mobile; Johnny Cash Medley; Who Are You; Young Man Blues (including Water); Baba O’Riley. The Star didn’t give me many words for this review, so here are some other thoughts that didn’t make the cut. The set was cut short by a couple songs. Most shows ended with “Without Your Love” and “Blue Red and Grey.” It was clear after “Baba O’Riley” that the spirit was willing, but the throat was weak. Still, it’s hard to complain about an evening packed with more than two hours of classic material. Filling standing room with folding chairs near the stage is usually the kiss of death for a performance – most fans would rather sit than stand. But the crowd in the pricey seats on the floor stood and cheered for most of the night, a refreshing change of pace. The first time I set foot inside the Midland Theater was when the touring version of the Broadway version of “Tommy” swung through town in the early ’90s. I was in high school at the time. Nearly 20 years later it was nice to come full circle.